Let’s start by getting one thing straight about “optimization.” As content marketers, we shouldn’t be optimizing our content for search engines. As Lee often points out, “Google doesn’t pay the bills. Your buyers pay the bills.” Therefore, optimize for users, not search engines. 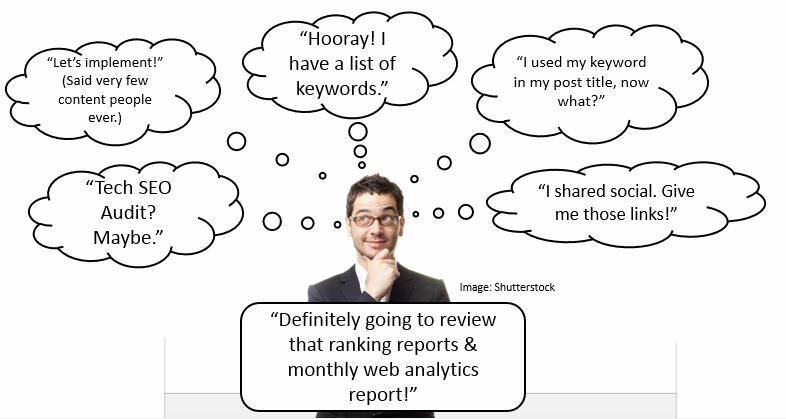 Old SEO rules would have you stuffing websites with keywords, creating thousands of new pages, tagging YouTube videos with every keyword you can get your hands on, and hoping something sticks. We give you permission to stop doing most, if not all of those things. Implement more than 1-2 tactics (10-20%). Perform Tech SEO Audit (Maybe). Use keywords in titles, links, copy etc. Share on social and wish for links. The problem with the list above is it looks a lot like 2010. Things have changed, and you should too. Can Tools Automate your SEO? At TopRank Marketing, we get asked about tools all the time. With all the tools, plugins and software available, it’s easy to believe that SEO is an automated function. It’s not. In fact, as Google’s algorithms become more complicated, it can be increasingly difficult to optimize your content. 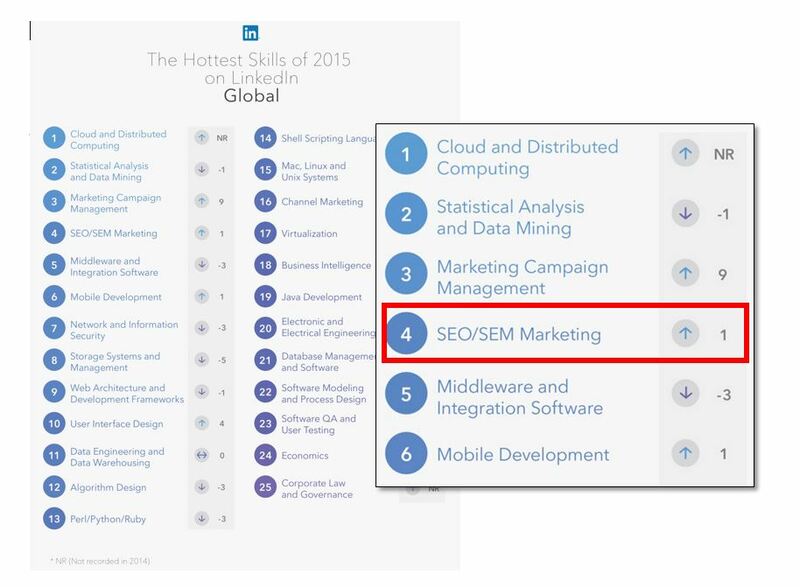 According to the most recent LinkedIn data, SEO and SEM ranks 4th among top skills companies seek (below). What this research doesn’t uncover is content marketers and SEOs are adopting an increasingly hybrid skillset. This is largely due to the fact that search engines now require higher quality content and a variety of content types, in order for content efforts to be most effective. Starting in 2013, an algorithm update was rolled out from Google, dubbed “Hummingbird.” This algorithm completely replaced the original Google algorithm, fundamentally changing the nature of how search engines crawl and rank web content. All you need to know is content quality, a variety of content types, and social media are all more important than ever. The first step to understanding your buyers is to accept that they are self-directed. They’ll go to Google, social media, their LinkedIn network, friends, or pick up the phone and ask for a reference long before they contact you, or consume any of your content. Understanding the nature of B2B self-directed buyers is crucial to the success of any SEO efforts tied to your content marketing. And in 2016, all of your potential customers are self-directed. According to Pardot, 70% of the buyer’s journey is complete before a buyer ever reaches out to sales. Which is why developing fruitful relationships between your marketing and sales department is fundamental to the success of your content marketing. 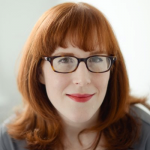 A common mistake among B2B marketers is someone from sales will reach out to a self-directed buyer, completely unaware that this buyer may have already started their journey. The sales professional (or targeted content in many cases) often treats them like they know nothing, or misses the delivers the wrong message to the prospect, based on where they are at in their journey. Say goodbye to that lead! Take a cue from Gartner, who has done some fascinating research on this topic. 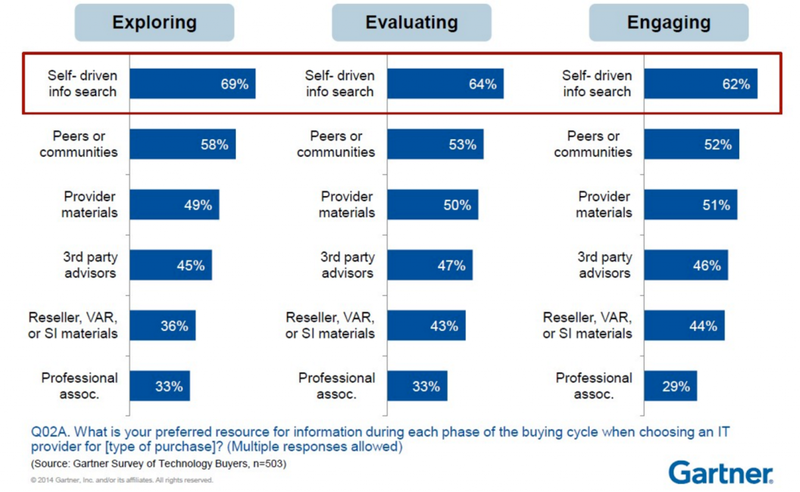 They uncovered that more than 60% of all buyers indicated they prefer a self-driven informational search at the exploration, evaluation, and engagement phase of their purchase cycle (see below). The bottom line is your customer wants to be in the driver’s seat. They don’t want a sales pitch. They want information. They don’t want your opinion. They want a third-party opinion of your product or service. They want information from Google, Bing, YouTube, industry reports, and third-party validations. Think about things from their point of view. They don’t know who to trust, what to believe, or who is trying to screw them over. So, what are your options? Be the best answer. Be a conduit for the information. Curate your third-party verifications, peer reviews, social media posts and other relevant content. So at this point, you might be asking yourself, “What does this have to do with SEO and content?” Fair question. Search engine queries are an explicit indication of intent. And tapping into the needs, intentions, and desires of your search audience will give you a solid map for the length, type, and style of content you must produce to meet your B2B audience’s needs. So, we’ve covered the state of SEO in 2016, we’ve accepted that our buyers are self-directed, and now we just need to create all that killer content that will make them fall in love with our brand. No pressure, right? 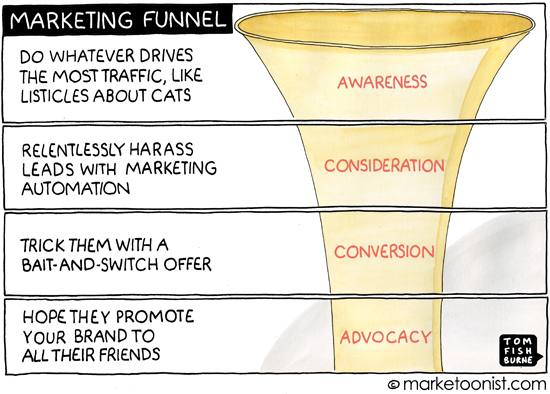 Let’s start by examining the following marketing funnel. It’s a solid example of what NOT to do. Instead of creating more useless content and barraging your leads with information, you should try to be the best answer in search engine results. Why? Because, by 2020 the world will have nearly 50 billion internet-connected devices. In addition, a full 90% of the world’s information has been created in the last 2 years alone. The bottom line is your prospects are overwhelmed. Before you can create content for your buyers, you’ll need to understand where search engines fit into your buyer’s journey. Start by talking to your customers. Ask them how they found out about you. Ask them what made them want to work with you, or buy your product. If your buyer’s are socially active, run a Twitter poll. If necessary, conduct some research to find out more about your audience. Most importantly, find out what types of content they are looking for via search engines, and where this fits in their journey. Granted, this list is a bit aggressive. Nonetheless, it illustrates the potential complexity of your buyer’s purchase process, and where search engines come in and out of the process. 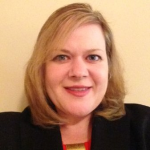 Your Buyers are Complex, Are You? Maybe you look at the list above and you think, “Yeah I already know all that.” Great. Maybe you’ve already identified the B2B content marketing tactic necessary to communicate with folks at different stages of their journey. Again, that’s awesome. But, are these tactics integrated? 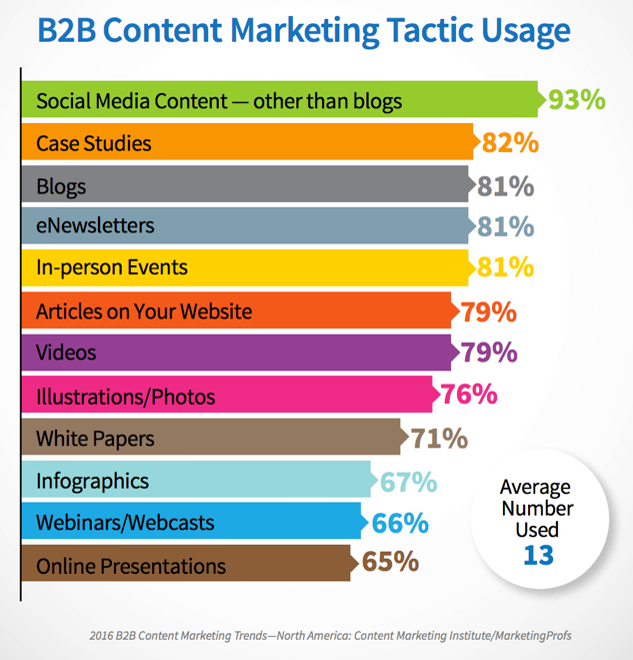 On the surface, it looks like B2B marketers are using a variety of tactics. But when you consider that 65% of B2B buyers think vendors should, “Curb their sales messaging”, you start to wonder if this chart represents an over-usage of a variety of channels to barrage buyers with sales messaging. If you need TopRank Marketing’s help to become the best answer for your customers, contact us today for a free consultation. You wrote a very instructive article.